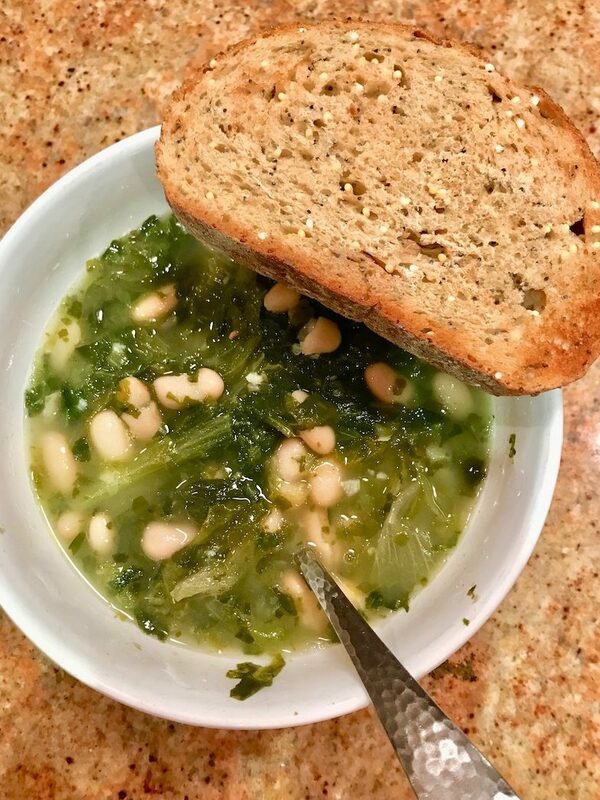 Escarole and beans. It’s the dish my mom always made me when I was sick. Best eaten with a big piece of crusty bread on a cold day! Sometimes the leafy greens are a bit intimidating for kids so I puree some of the soup and add orzo! Great way to sneak some greens into your kid’s diet. Remove the white part of the escarole and discard. Chop the leafy green part and rinse well. Add washed escarole to the boiling water and boil for 5 minutes or until all the greens have wilted. Drain the escarole and set aside. Note: I like boiling my escarole because I find that it removes the bitterness. In the same pot add the olive oil and chopped garlic. Saute the garlic until it just starts to turn golden brown. Add back the escarole plus the chicken stock and beans. Ladle soup into a bowl, sprinkle grated parm and serve with a big piece of crusty bread! Using a emulsion blender blend the soup so that it still has some texture. Ladle soup into a bowl, sprinkle grated parm and enjoy!